The number one factor affecting the quality and nutrient content of hay is the maturity at which the hay is harvested. As the maturity increases and the forage plant passes from vegetative stage to reproductive growth with seed head formation and on to seed development, quality steadily declines. The rate of quality decline is generally steepest during the first cutting in the spring through early summer. Other factors that play a role in determining hay quality include forage species, rainfall during the drying and harvest process, soil fertility, and storage conditions. Although visual assessment can provide some clues as to hay quality and can help to separate hay into general categories, it will not be able to provide a specific quantitative value regarding crude protein, energy content, fiber content and minerals. To get that information, this requires a chemical analysis from a qualified forage testing lab. Most sheep owners should at least know the crude protein (CP) and energy content of their hay. Energy content as total digestible nutrients (TDN) is a calculated value derived from a formula that uses the fiber content of the forage. 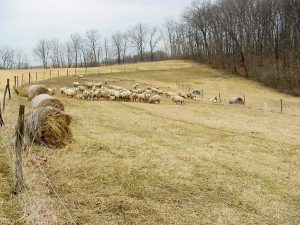 Knowing the nutrient content of your hay is interesting, but it is only useful if compared or matched to the nutrient requirements of your sheep. The national research council (NRC) has determined the nutrient requirements of various production stages of sheep. 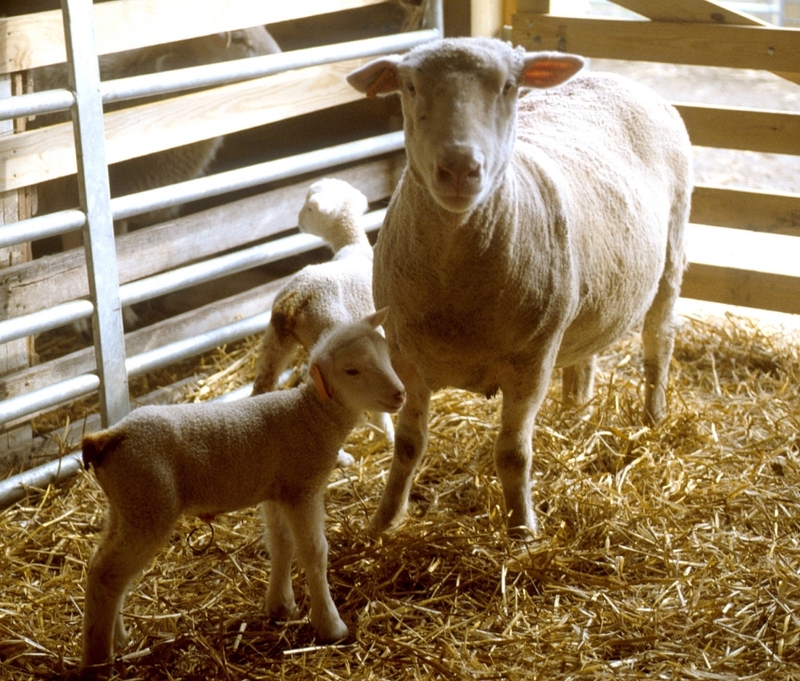 Some examples of those production stages include stage of gestation, last 4 weeks of gestation with 180-225% expected lamb crop, early lactation with twins, early weaned lambs with moderate growth expectation, finishing lambs, replacement ewes, etc. For each production stage, the NRC tables list nutrient needs in terms of crude protein, energy as TDN, some of the major minerals such as calcium and phosphorus along with vitamin A and E requirements. These requirements are minimum requirements and higher levels, especially in regard to energy, may be required depending upon the environmental and physical circumstances of the animal. The next step is matching hay nutritional content to our sheep nutrient needs. Which production class does this hay match up best with? Are there limitations to intake because of high fiber content that need to be considered? For example, if my hay has a CP content of 10% with 55% TDN, where is that hay best used? If I look at NRC tables I will see that it can meet the requirements of ewes through the first 15 weeks of gestation, but if I want to use it for the last 4 weeks of gestation or into early lactation, I will need to supplement with additional crude protein and energy. On the other hand, if I have hay with 16% CP and 67% TDN, I could use this hay and meet nutritional requirements of all stages of ewe production. Much more could be said about using the information from a hay test and the NRC requirement tables to calculate sheep rations, but these basics will get you started in the right direction. Remember to let the animal’s body condition score tell you if nutrient needs are being met. Posted by Braden Campbell at 8:00am January 4, 2019 Posted in Nutrition and tagged Forages and Pasture, Management, Nutrition. Bookmark the permalink.